Christopher Nolan introduced The Joker in style when he paid homage to both Batman: Year One and The Killing Joke at the end of Batman Begins by teasing the villain's existence, making way for a great, IMAX-shot opening reveal in the sequel. 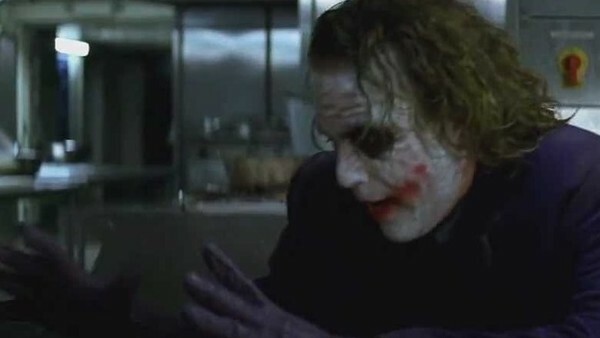 As if his unmasking at the very start of The Dark Knight wasn't enough, The Joker really made his presence felt in the movie by performing a pencil related magic trick which was both shocking and violent. In doing so, he also pushed the boundaries of what's allowed in a 12A movie. Over 200 complaints were made to the British Board of Film Classification, the most they received between 2000 - 2010. In fact, roughly 42% of the letters they received in 2008 were from disgruntled and possibly disgusted viewers of The Dark Knight, a clear sign that this version of The Joker was causing chaos.